In Hinduism, Shiva and Shakti represent the balance between male and female, between meditation and energy. Shiva and Shakti go by various names and forms in India, such as Shankara and Durga, or Bhairav and Bhairavi. 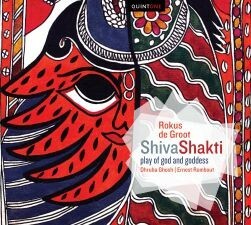 The performance on this CD is inspired by various sources on Shiva and Shakti. Interesting cross-cultural project of traditional Hindu music making and Western contemporary composition techniques. Of special interest to Hindu communities all over the globe and people who like both modern classics and world music.